Well, we have our first instance of a company citing last month’s Supreme Court ruling against Dodd-Frank whistleblower protections to argue against a whistleblower retaliation award. Bio-Rad Laboratories, ordered last year to pay $11 million in a whistleblower retaliation lawsuit, was back in court earlier this week arguing that its damages should be cut by more than 25 percent. Why? Because the whistleblower — Sanford Wadler, the company’s former general counsel — doesn’t qualify for the full amount under the Supreme Court’s Feb. 21 ruling Digital Realty Trust v. Somers, Bio-Rad’s lawyers said. In that ruling, the Supreme Court said Dodd-Frank whistleblower protections only apply to people who first report their concerns to the Securities & Exchange Commission. Which Wadler did not do. Hence Bio-Rad’s lawyers filed a memo with the 9th Circuit Court of Appeals on Monday, arguing that last year’s judgment based on Wadler’s Dodd-Frank claim should be vacated, along with $2.96 million damages attributable to that claim. It’s unclear what might happen next in this specific case. Wadler originally had fears that Bio-Rad was violating the Foreign Corrupt Practices Act with bribery in China, and brought his concerns the Bio-Rad’s audit committee. The committee investigated, found no evidence of wrongdoing, and fired Wadler shortly thereafter in 2015. Wadler sued, citing Dodd-Frank’s whistleblower protections. He won last at the district court level, and Bio-Rad appealed to the 9th Circuit. That case was still pending when the Supreme Court made its Digital Realty ruling. The appellate court could remand the whole saga back to district court for further review, or side with Bio-Rad and cut the damages directly. We’ll have to wait and see. Compliance professionals have a few issues to unpack here. First are the implications of this move on all the other allegations of misconduct out there — above all, the allegations that thoughtful employees have yet to bring to compliance officers’ attention. Those people will look at this whistleblower drama-rama and think, “Whoa, dude might lose $3 million because he didn’t call the SEC first!” Then they’ll call the SEC, rather than you, their manager, or anyone else at the company. I understand that Wadler is an imperfect vehicle to raise this point. He was Bio-Rad’s general counsel, and had a legal obligation to report his concerns internally. Who cares, other than legal theorists looking for hairs to split? In the real world, most employees don’t have that obligation. They’ll look right past it, to the larger lesson that if you can only secure whistleblower protections by first contacting the SEC, then you should first contact the SEC. Second, we can’t fault Bio-Rad’s lawyers for raising this line of argument. Their job is to reduce Bio-Rad’s legal liability. The Digital Realty Trust decision gives them an avenue to do that. Still, this tool that’s useful for the legal department also screws things up for the compliance department. As I said in an earlier post about this ruling: compliance officers still have the challenge of building strong a anti-retaliation culture, while legal departments use the Digital Realty ruling and undermine your message. Digital Realty Trust will pit legal and compliance department interests against each other. That’s bad. I fear it will be especially bad for organizations where the compliance function answers into the legal department, because then the legal function’s interests will always win out. Third, I suspect we have some Code of Conduct and policy implications that haven’t been fully explored yet. Namely, can a company still require employees to report allegations of misconduct internally, if that might somehow jeopardize their anti-retaliation rights under the Dodd-Frank Act? For example, if your Code requires internal disclosure, which the employee fulfills, and then someone retaliates against him or her — does the employee now have no retaliation claim under the Dodd-Frank Act? That strikes me as unfair, and within spitting distance of pre-taliation risk that regulators already frown upon. Should policies be amended to state clearly that the employee gives up anti-retaliation rights unless he or she also reports to the SEC simultaneously? I can foresee questions like that, around what duties a company has to tell employees about the possible consequences of their actions. And again, getting back to the difference between legal and compliance functions — even if outside counsel gives you an answer that’s correct under the law, what’s the best answer in the real world, where ethics and compliance officers work with actual human employees? 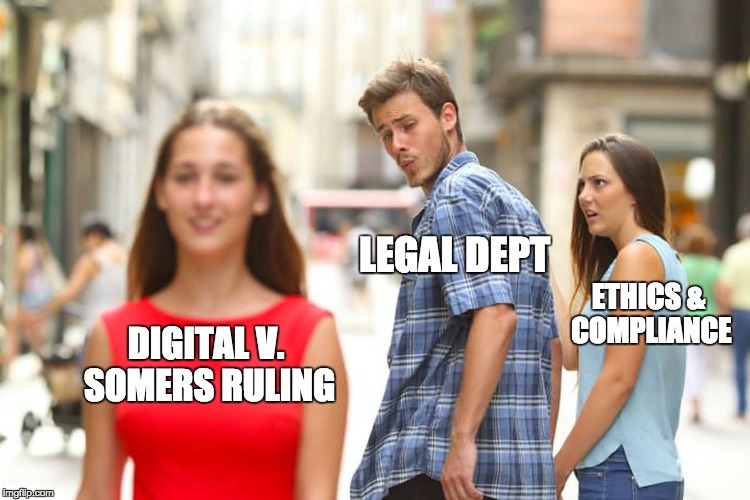 The Digital Realty Trust ruling was always going to usher in a new world of complexity for corporate compliance officers. Now it’s here.